Welcome to the Pond Testing Equipment superstore! Keeping your pond's water properly balanced is essential to maintaining the optimum health, beauty, and lifespan of your pond fish and plants. Keeping a sharp eye on the pH especially is crucial to avoiding huge algae blooms and preventing permanent damage to your fish, plants and pond equipment. While this seems like a job for a professional chemist, it's actually quite easy! With a simple at-home water testing kit, you can pinpoint your water's chemistry in seconds. You'll be amazed at how many common pond water problems simple disappear when you begin monitoring the water chemistry. Pet Mountain's Pond Testing Equipment store features top quality products from PondCare, one of the most trusted names in pond water care and maintenance. 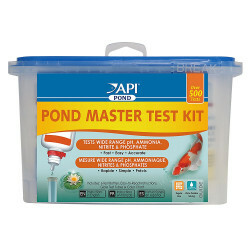 The PondCare Master Liquid Test Kit for Ponds is a complete kit for testing tap water & pond water. It tests water 4 different ways to protect pond fish from dangerous water conditions. This kit lasts for 6 months on the shelf and is the simplest way to test your water. 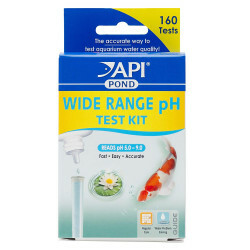 The PondCare Liquid Wide Range pH Test Kit quickly and accurately measures the pH of pond water, reading pH levels from 5.0 to 9.0. Prevent the harmful effects of too alkaline/too acidic pond water resulting from minerals found in tap water, high ammonia levels in the pond, rain runoff or overstocking of pond fish. Includes test solution, glass test tube w/ cap, color chart & instructions.